Thanks to a new campus safety app, UIC students and employees can now take a virtual walk with a friend — sharing their location until they arrive at their destination — contact UIC Police with just the push of a button, and more. 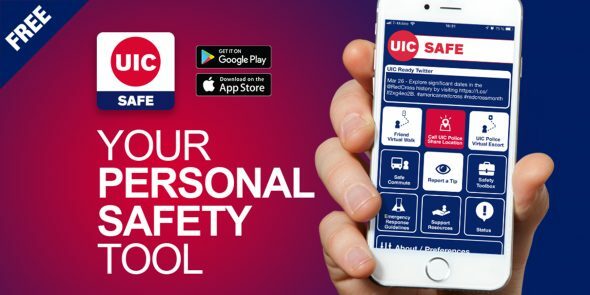 The UIC SAFE mobile app provides a personal safety tool that users can carry with them on their smartphones. The app is a one-stop shop that puts all campus safety and emergency preparedness information in one place, enhancing campus safety tools currently available to students and employees. Report a tip: report a crime or share anonymous information with UIC Police. Users must log in with a NetID and password to use the app, but parents and friends who are not affiliated with UIC can still track users’ progress through the virtual walk — the app with send out a map and provide updates until the end of the virtual walk, Ibrahim said. Students and employees should also follow @UICReady on Twitter for campus safety information, he said. The app, which replaces the UIC Rave Guardian app, was built through a collaboration of multiple campus departments, including the Office of Preparedness and Response, Office of Public and Government Affairs, UIC Police and more.